A New, Geoff Style, Loudspeaker. I can safely claim this is the only one of these you will ever see ! The Nasa Vhf has a stupid arrangement whereby, when you plug in the extension remote speaker jack, it disables the sets speakers - and its a fiddly little thing right around the back. I figured, if I added an extra, interior speaker - then I could have a switch to swap between the two. 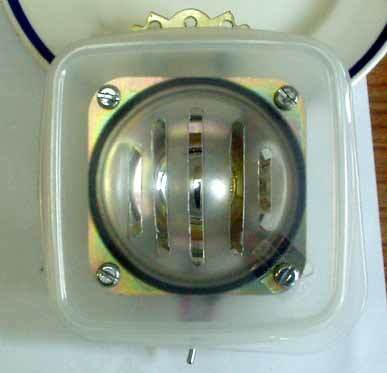 This is an 8 ohm, Maplins - mylar material cone - about three pounds, as a bare unit. So - the plastic food box just fitted the bill to house it. Either fixed with the brass hinge, or it will screw straight on through the base. The Nasa set works fine - I even get Brixham CG in Weston s Mare on a god day ! - but this was a real annoyance with this model. Not sure whether it changed with the recent new version ?